505 Regency ~ Home Away From Home! Unit 505 Regency is beautiful with its nautical theme! Has some special features with a walk in shower and 2 power recliners and 1 lift recliner. If you need something larger we have a beautiful 3 bedroom, 3 bath unit also located on the 5th floor ~ we have room for everyone! Tropical beauty with all the comforts of home ~ That describes our spacious 2 bedroom fifth floor Gulf front condo at the Regency. Our fifth floor condo has some great open dates this summer and fall. We have just added new linens, kitchenware, etc. so we are ready for our spring and summer guests! Come and create memories that will last a lifetime! 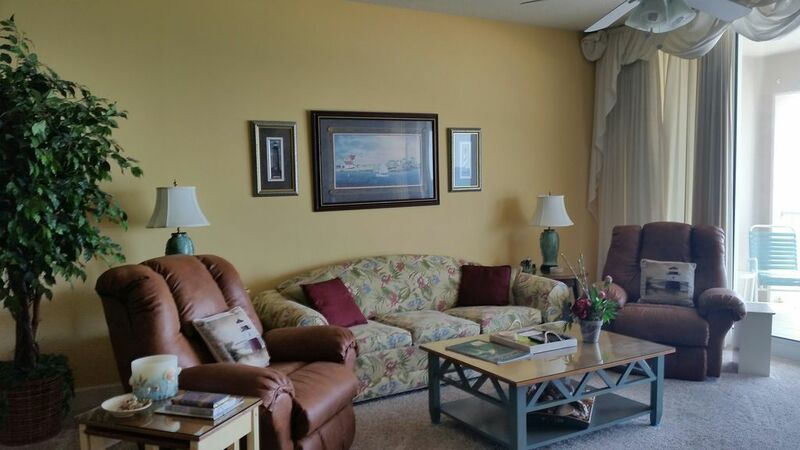 We have great views and a spacious floorplan and sit right on the beach! The Regency and Navarre Beach are THE place to vacation! We have sun, sand and surf for you and your family to enjoy during your vacation. Most importantly, we have all that but without the crowds of other Florida beaches! We have a wonderful fitness center on site for you to continue your daily workouts and a beautiful pool to enjoy while not on the beach! The pool is heated to 82 degrees from March through October. You can also see Florida’s longest fishing pier from the balcony or better yet, bring your pole and catch dinner! I have multiple units on Navarre Beach ~ love to look for units at other locations for you if this is not available. Our weeks run Sat. to Sat. You may reserve for less than a week at certain times but check in or check out must be on Saturday. There is a refundable $250.00 damage deposit required with Rental Agreement. I look forward to helping you plan a great vacation on Navarre Beach. In unit 505 you will enjoy cooking a gourmet meal for your family in our fully equipped kitchen with all the gadgets, dishes, and linens that you will need to have at your fingertips during your stay. There is seating for six at the table and three at the bar. No detail has been overlooked in the master suite. It has generous closet space with floor to ceiling mirrored doors. The master bathroom is complete with a whirlpool tub/shower combination and plenty of counter space. For evening sunset views, the balcony is accessible from the master bedroom through sliding glass doors. Our private 8 x 30 balcony is comfortably furnished for eating or relaxing. Our second guest bedroom is tastefully furnished with two comfortable full sized beds, ample closet space, and of course a TV/DVD combination for evening entertainment. There is a spacious, private guest bathroom attached. This bath is equipped with a walk in shower. Unit 505 Regency also features its own laundry room with a full sized washer and dryer. You will also enjoy complimentary WIFI access in the condo also. You will be pleasantly surprised at the ease with which you will park your car, use our keyless entry to enter the front door, unpack, and begin enjoying your vacation immediately. You will not be disappointed with this unforgettable condominium experience. We do not have the typical rental unit and know that you will want to return again and again. We offer fantastic views, upscale and comfortable furnishings and a fully equipped kitchen to guarantee a relaxing and enjoyable vacation for you and your family. If you enjoy excellence and attention to detail in your everyday life we believe you should expect no less when on vacation. Email or call me today – I love to talk about our beautiful beach and help you plan the vacation that will give you memories for a lifetime! Weeks run Sat – Sat. Call or email today…….let’s get this vacation started………. Happily married for 45 years! My husband and I fell in love with Navarre Beach the first time we saw it! We had always vacationed in the Panhandle of Florida but Navarre Beach was even more special than surrounding areas. We enjoy the Sun, Sand, and Surf! We especially enjoy the family friendly atmosphere of the area. Our condo has upgraded cabinetry and is fully equipped. Our guest bath has a walk in shower which is especially nice for our older friends and guests. The 5th floor is the perfect height - feel like you're on the beach but without beach noise. We are almost in the middle of the complex so elevators on either end are convenient. Come and experience the lifestyle found with island living! Sits right on the Gulf! Fully equipped ~ like cooking at home! We have a wonderful fitness center located on the first floor. We also have a meeting room that can be rented by guests staying at the complex. Temporary storage area located at the pool area for floats, chairs, etc. Wonderful place with a wonderful view on both sides of the condo. Gulf on one side and bay on the other. Had a great time in our first visit to Navarre. The room was perfect for my family of four. Room had everything we needed, was clean, and had a great view. Would definitely recommend. Glad you had a good trip and found the condo well stocked and clean!! Come back soon! Everything was great - the furniture was comfortable, the place was clean, there were plenty of towels, washcloths, dishrags, etc. Everything we needed was there. We had a great time and will definitely look at booking this condo again for our next stay! So glad you had a good trip and found everything you needed during your stay! I will pass along the information to our housekeeper too! Come back soon! The condo was clean, well stocked in the kitchen, extra pillows & blankets, beach accessories, I would definitely recommend it!! This was our first trip to Navarre Beach and we loved it!! The view from the balcony was beautiful, this is definitely my favorite place!! We vacation to relax on the beach but if you like to go explore, you are close to Pensacola, Ft. Walton, and Destin. We ate at East River Smokehouse, one evening, and it was very good!! Will definitely be back! So glad your first Navarre Beach trip was a success!! It is a little slice of paradise! Glad you enjoyed the condo and had everything you needed! This was our third time to stay here and as before, we throughly enjoyed it. Property is well kept, clean and peaceful and makes for a wonderful beachfront getaway. Thank you for coming back!!! Hope to see you again next year! Unit 505 was wonderful. It was clean, comfortable, and full of little touches that made us feel at home. The master bedroom was spacious and incredibly relaxing, as was the huge balcony. We look forward to returning to this unit next year! So glad you enjoyed 505 Regency! Love to know our guests had everything they needed and loved it as much as we Do! In the area: Naval Air Museum - home of the Blue Angels. The Zoo in Gulf Breeze. Gulfairium in Fort Walton. The Butterfly house in Navarre. National Seashore ~ 17 mile drive between Navarre Beach and Pensacola Beach.